I’ve grown this season – whether I’ve wanted to or not. People have been kind, patient, and straight-forward (thank you.) Fortunately, with so much to learn, my empty bucket caught a lot of good hard “life stuff.” I even resisted sitting with a gallon of extreme Moosetracks, a bottle of wine, and the entire Gilmore Girls telly series (I’ve heard it’s good.) Until last night. 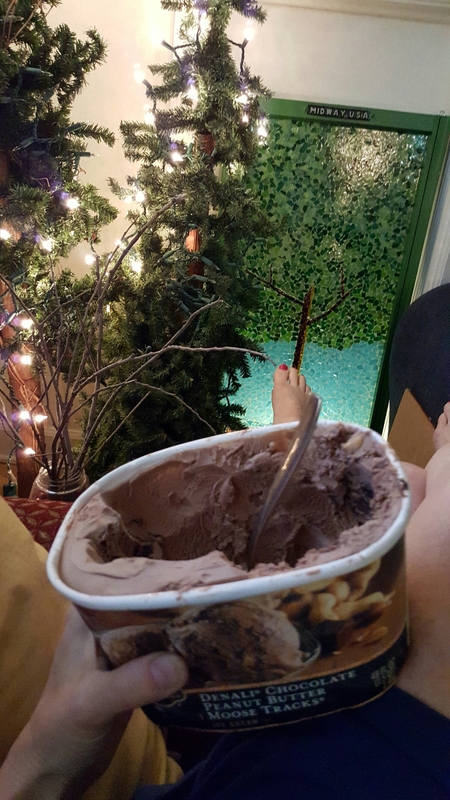 It wasn’t the wine or Gilmore Girls…it was the ice cream. Madi and the giant pup left the homestead Sunday and my cozy apartment felt empty. What sorts of good life decisions to make when bittersweet fills the afternoon? I dodged to Dillons for a bit of Moosetrack therapy which I enjoyed in a big bowl later in the evening…slurping solo. With the first bowl filling unfilled places in the season, I returned with a spoon to pry out more crunchy salty fudge bits. It was so sweet. Satisfying for a few minutes until it wasn’t. Fast forward to Monday (today) after work. I got home and thought about that tasty ribbon of Moosetracks salty crunchy fudge. Why not have a teensy bowl before I run to dinner with my pals? And an extra scoop with my trusty spoon. Dinner was a feast of friends, stories, laughter, a simple meal, and tasty beverage. After several months dessert hiatus, Trish announced Gil had picked up a treat of my favorite gourmet ice cream! I urped ice cream all evening. And thought about scooping more Moosetracks into those empty spaces until now as I turn off the light. This has me thinking: sweetness wants more sweet. We learn to crave it so quickly like the feelings of love before loss. Research indicates we crave love and sweet like addicts crave their next hit. Just like those feelings, I’m weaning myself off of the ice cream from tonight forward. Just two days of diving in and it is already firmly rooted in my DNA: #MoreMoosetracks! Like the downbeat of love and then loss, I’m going to get out there and live a bit differently so my appetite is for joy and people and new adventures and quiet and service and opportunity. I’ll appreciate the sweet when it comes, but not plan my life around a tasty daily bowl. Let’s not regret the rich sweetness nor limit the love by making it into something it isn’t. It is delightful. Sweet. Rich. Woohoo. But we can live without the Moosetracks and without that specific brand of relationship sweetness. Spoons raised to our collective derringdo.